NEW VOLUNTARY CODES of Practice for the advertising and marketing of food and non-alcoholic drinks have received a string of mixed reactions today. The new Codes, which have been agreed with the food industry and apply to non-broadcast media, aim to ensure that foods high in fat, salt and sugar (HFSS) are marketed in a responsible way. The Department of Health said that the Codes seek to ensure that children are not exposed to inappropriate marketing, advertising or sponsorship associated with these kinds of foods and drink products and that healthier food choices are actively promoted. 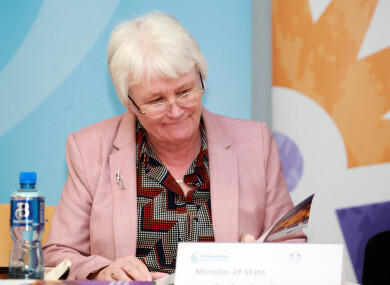 The Codes, launched by Minister of State for Health Promotion Catherine Byrne, include an agreement on the reduction of advertising, marketing and sponsorship of HFSS. Retail Ireland has also agreed to increase its promotion – via product placement and in-store promotions – of healthier options. The initiative is a government response to the rise in obesity levels in Ireland, and is part of the National Obesity Policy and Action Plan. Minister Byrne said the purpose of the Codes is to “reduce the exposure of children to unhealthy foods” and “to moderate the exposure of the general population to foods high in HFSS”. “These Codes of Practice represent an opportunity to discourage unhealthy food consumption choices and patterns which can contribute to ill health, overweight and obesity, and chronic disease,” she said. Some concern has been raised about the voluntary nature of the new Codes. Sinn Féin MEP Lynn Boylan hit out at the Department of Health, claiming that the voluntary model has “already failed in every country it has been tried in”. “Ireland cannot afford to waste more time implementing failed policies while our childhood obesity problem continues to get worse,” Boylan said. State-funded research estimates that 85,000 children on the island of Ireland will prematurely die to overweight and obesity. The introduction of a voluntary code rather than a mandatory legislation will not do anything to help the situation – it will only delay real action on the issue. Boylan called on the government to offer alternative legislation which would penalise those who breach the Codes. The Codes of Practice were created over a 15-month period in consultation with various sectors including IBEC, Food Drink Ireland, Retail Ireland, the Broadcasting Authority of Ireland, and the Advertising Standards Authority of Ireland, amongst others. Despite Boylan’s concerns of today’s announcement, Food Drink Ireland welcomed the publication of the Codes. “Food and beverage companies are committed to responsible marketing and supporting the implementation of related recommendations in [the action plan]. The focus now has to be on effective implementation,” Paul Kelly, director of Food Drink Ireland said. Kelly called on Minister Byrne to quickly bring together the key participants to develop the promised technical guidance document that advertisers, rights owners, media outlets and advertising practitioners now needed to bring the Codes to life. Email “Mixed reactions over new voluntary codes to restrict advertising of 'high fat sugar salt' foods”. Feedback on “Mixed reactions over new voluntary codes to restrict advertising of 'high fat sugar salt' foods”.